Tech Readers » Mobilink Indigo Brings Unmatched BlackBerry Bundle Offers! April 23, 2019 7:15 pm You are here:Home Telecom Cellular Mobilink Mobilink Indigo Brings Unmatched BlackBerry Bundle Offers! How often do we get to see amazing value offers on mobile phones and in that also, especially on BlackBerry? 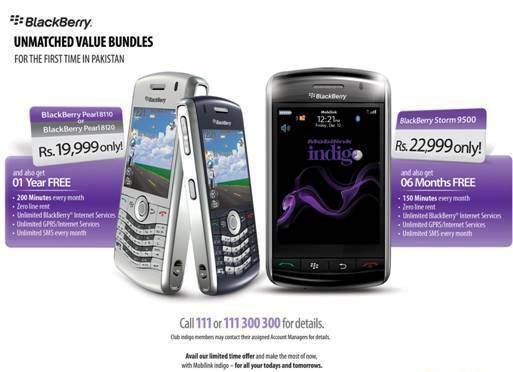 Well, Mobilink indigo being the pioneer of introducing BlackBerry smartphones in Pakistan now brings for its customers unmatched value bundles at the beginning of 2011 as a New Year gift! For the first time in Pakistan, Mobilink indigo is launching an amazing offer whereby all customers can enjoy BlackBerry handsets at amazing prices bundled with various value additions for free! The classy touchscreen BlackBerry Storm 9500 smartphone is now available for only Rs. 22,999 with the following value additions, FREE for 6 months! This is not all, the sleek and stylish BlackBerry Pearl (8100 or 8120) smartphone is available for Rs. 19,999 only, with the following value additions FREE for 1 whole year! 5 Responses to "Mobilink Indigo Brings Unmatched BlackBerry Bundle Offers!" Storm for 22999!! i think thats brilliantly priced. and it has so many free goodies with it too!! Originally Posted By MaheenStorm for 22999!! i think thats brilliantly priced. and it has so many free goodies with it too!! Yes, that’s very reasonable price.